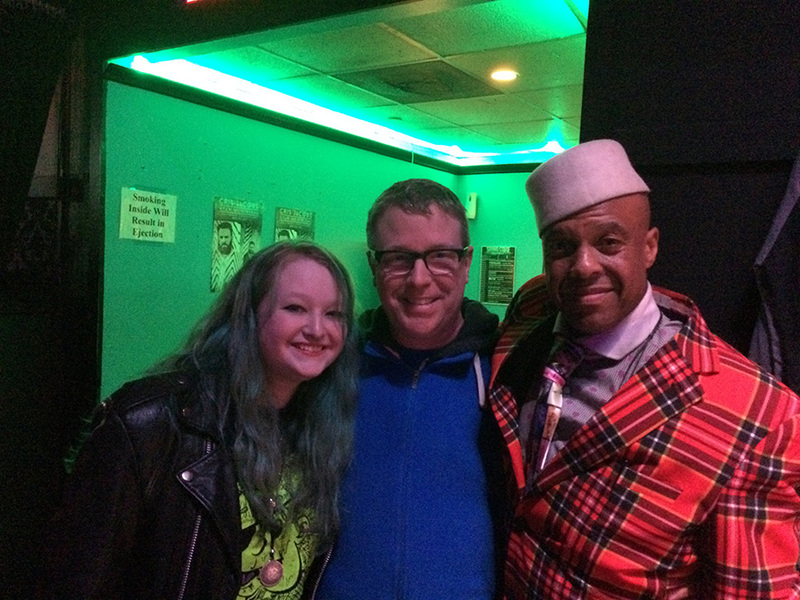 It’s a great honor and privilege to introduce my daughter to the hardest working live band in the world – the mighty Fishbone. 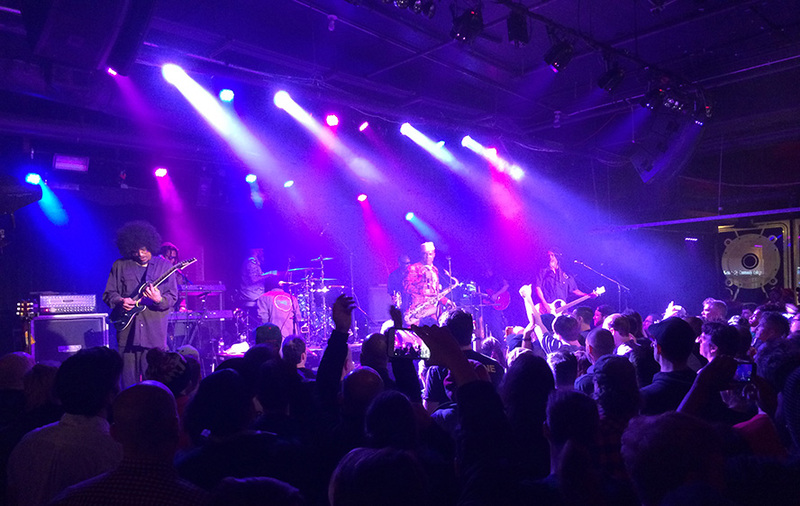 At the Baltimore Soundstage. I told Angelo it was Coco’s first Fishbone show, and he kissed her on the cheek. Continuing from last year’s STEM project, Leezle and I used the remaining neck from the guitar roller coaster project to make a sound projecting instrument. The main requirement was we could only use stuff we already had on hand – nothing could be purchased. Leezle is passionate about cello, and if I may say so, has become quite accomplished. 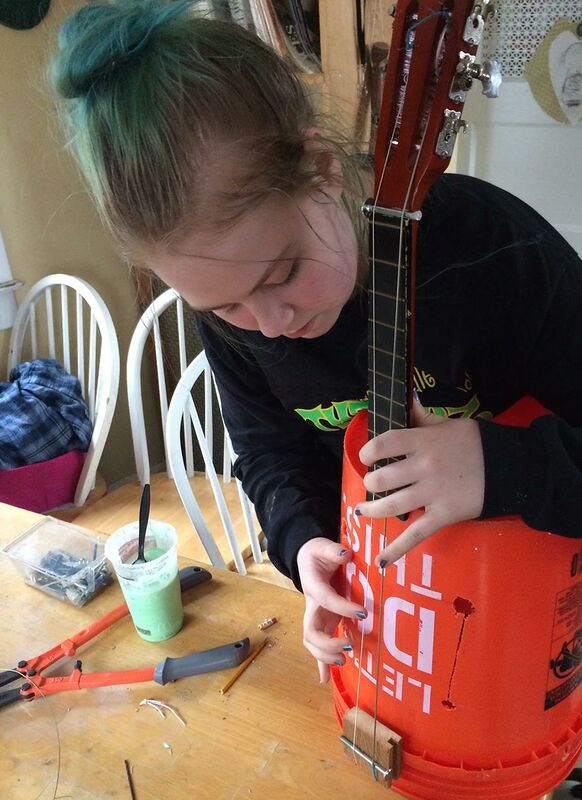 She wanted to make something resembling a cello or bass. 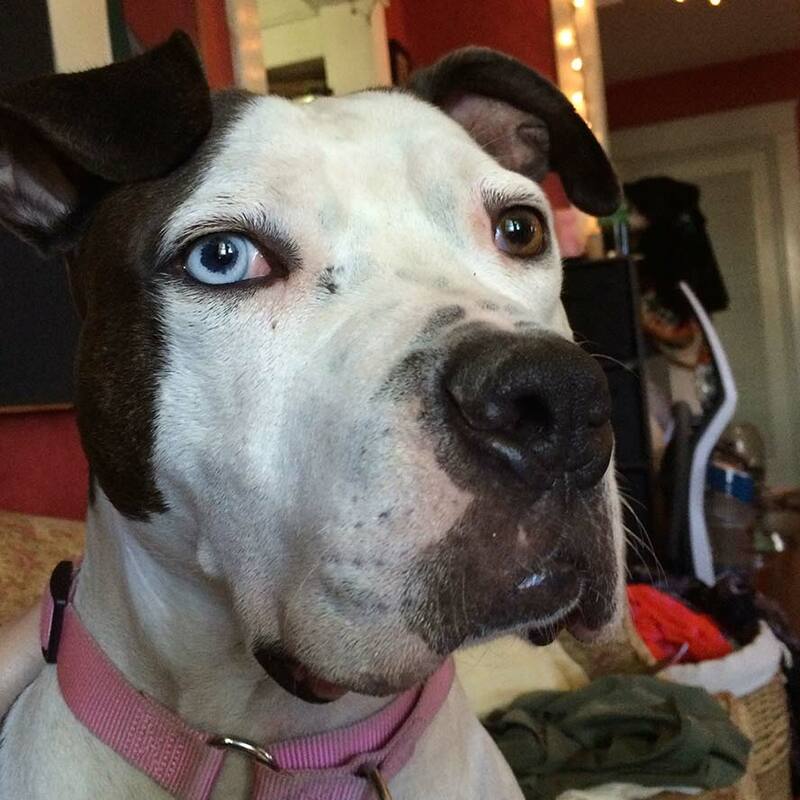 Alice the pitbull’s favorite toys are buckets. 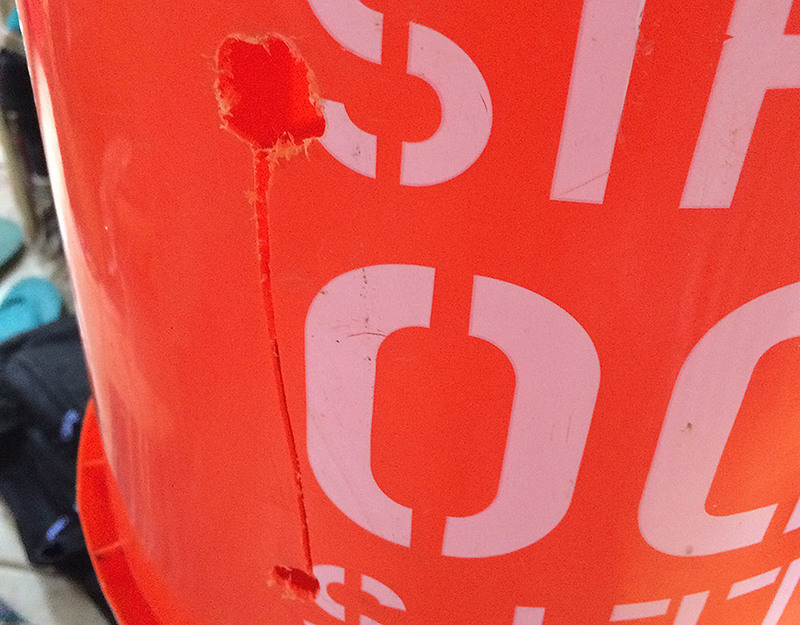 Luckily, there are extra buckets on hand. Leezle made “F” holes, which ended up being “I” holes. 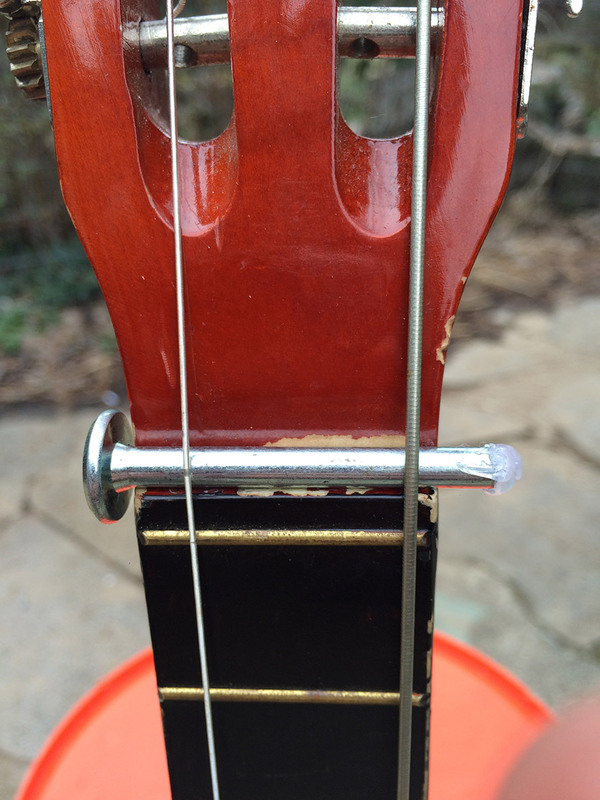 We used two bolts to make the neck and bridge nuts. 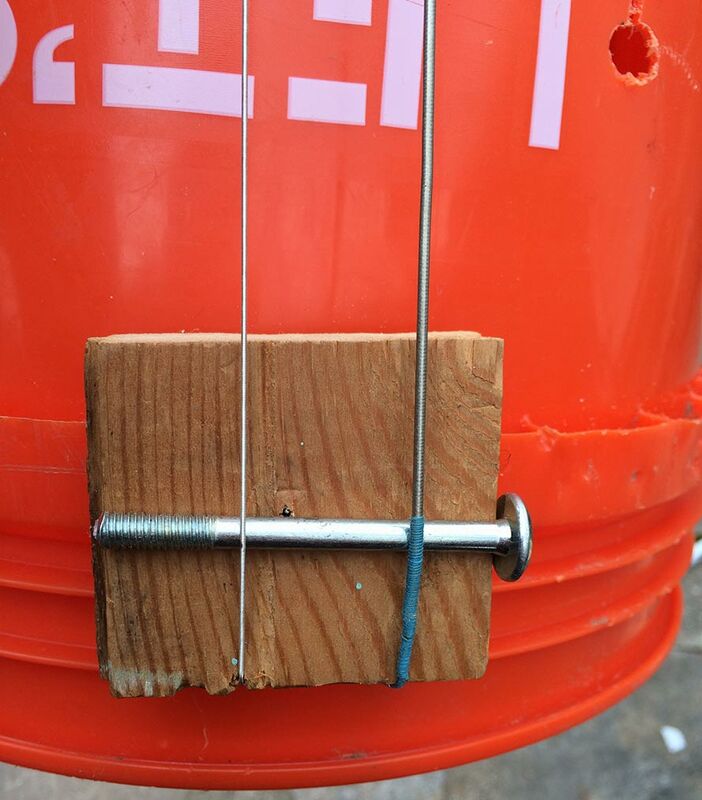 It actually works – the next only has 3 tuning pegs, so it’s a 3 string instrument. Beef Platter Records posted several videos of Blister Freak Circus at the South West Baltimore Festival, the hot summer on 1994. I came into this B.C. Rich Warlock for $40 though a combination of goodwill, generosity and luck (thank you, thank you, thank you 99¢). 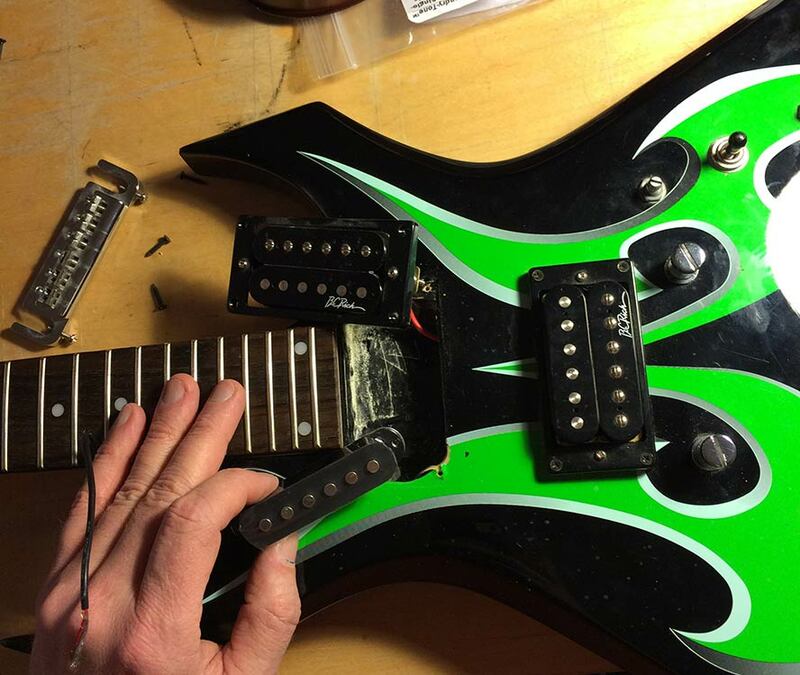 It was in very good condition, with the only issue being a ding on the 7th fret that catches when I bend the B string. That’s not a big deal. It adds a little character. It’s heavier than the cheapie Stratocasters that are coming from India (or where ever) – it’s solid! I bought a really, really cheap single coil pick-up on Amazon for around $2.00 and swapped out the neck position humbucker. 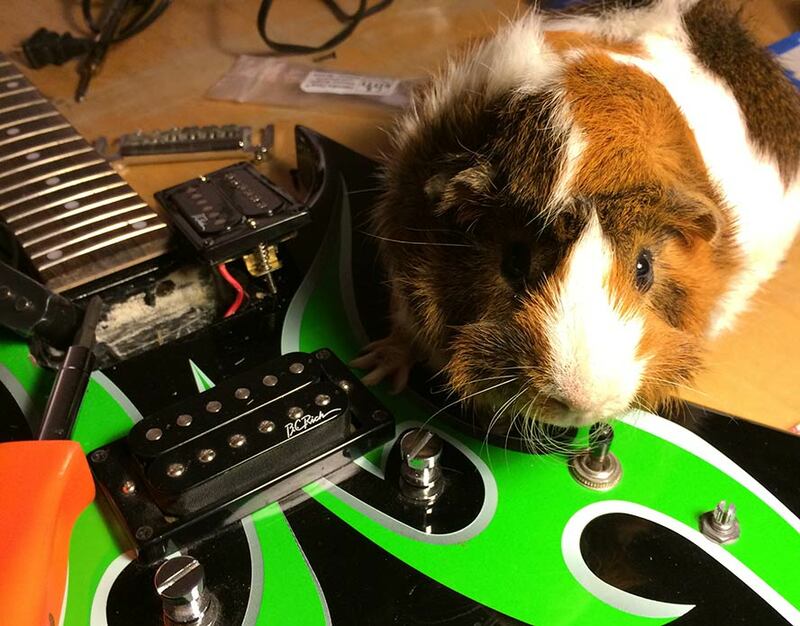 Fat Charlie ate the neck Humbucker. He eats everything. At the time, I didn’t have an amplifier, so I tested it through a POD. Oh, and I added strap locks, too. It helps with the body shape. 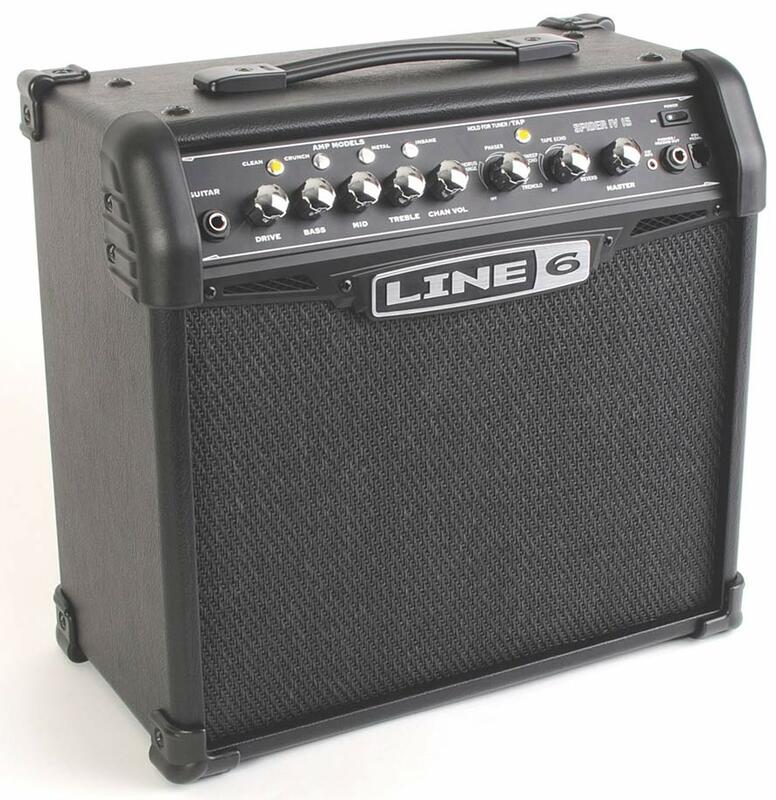 Since then, I found a Line 6 Spider IV 15 15-watt 1×8 Modeling Guitar Amplifier at Goodwill for $20. It’s easily the best small amp I’ve ever played through – better than any of my old Fender Champs, or anything I’ve seen at this size. Best of all, it has a button labeled “INSANE.” We all need that. 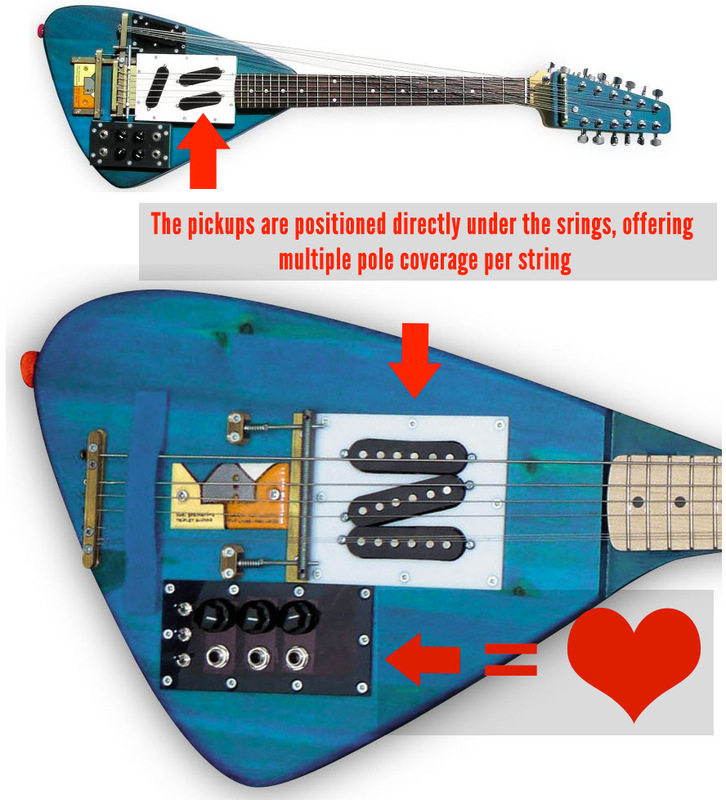 I strung the guitar with four .012 gauge “E” strings (on the low “E,” “A,” “D,” “G” strings). 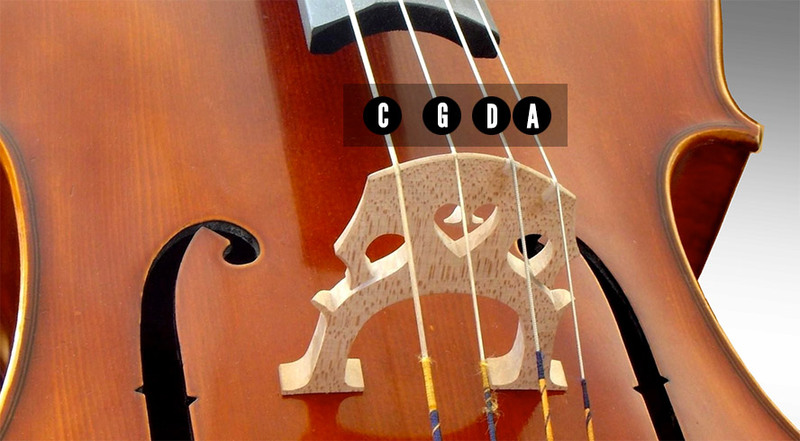 I often drop the low “E” to a “C,” and I envisioned the typical tuning of these four string to be that of a cello. Listening to my Leezle practice inspired the cello tuning idea. I love alternate tunings. I love cello. I love bass and lower playing in lower registers. I thought that this tuning might make an appealing guitar for her, too. The added tension of the three heavier strings is the reason I wanted a tremolo free guitar, as intonation can get wonky. 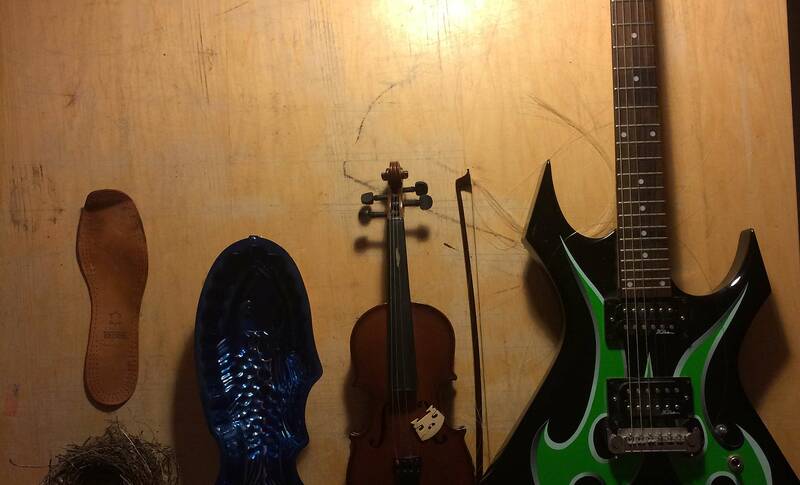 The tonal interactions between four string with the same gauge is interesting. Back in the noisy Bazooka Joe days, Jeff “Guppy” Caplin and I spent many hours exploring dissonance, overtones and seeking harmonic resolution. I still find that fascinating, but perhaps without quite so much distortion. 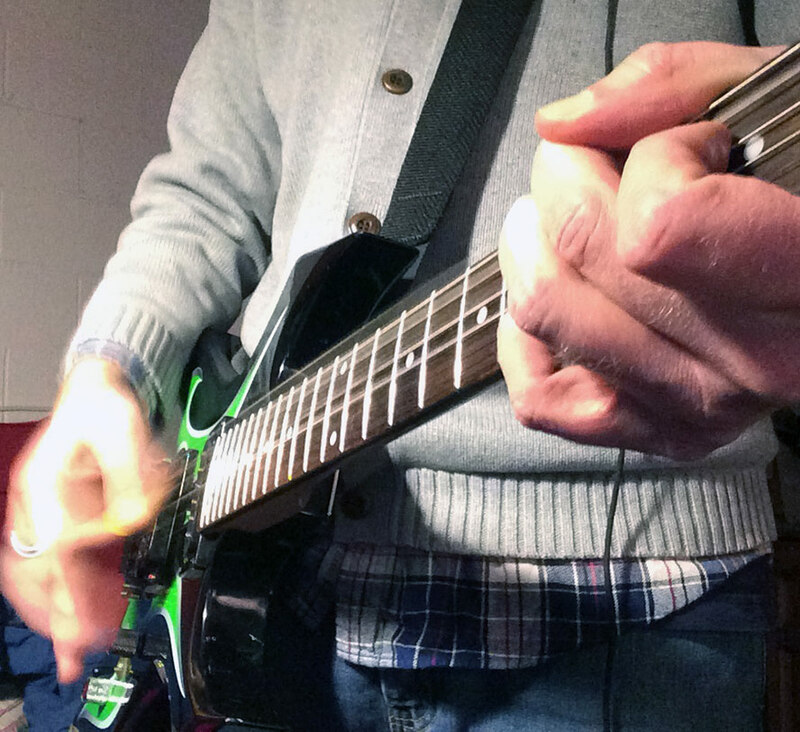 So far, so good – the guitar plays well and has offered some great musical possibilities. I would like to do some recording with it. Soon. I am inspired by the work of Yuri Landman. In particular, I would love to have multiple line outputs and a denser pickup array under the strings (See below). 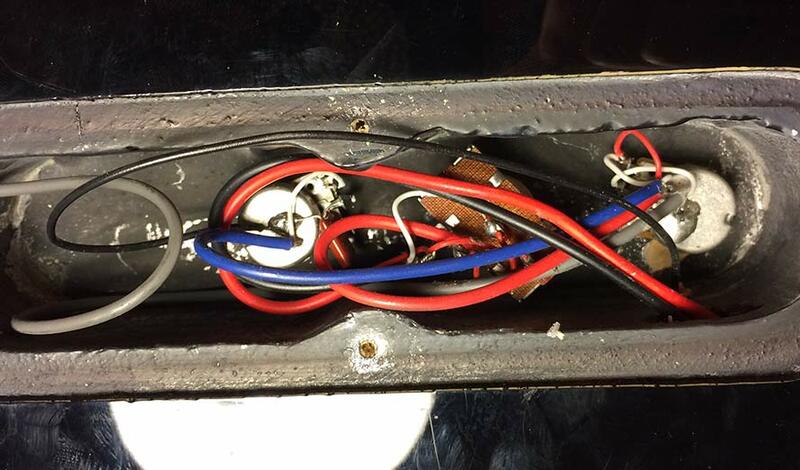 So, the next step is add outputs and more pick-ups. Here’s a recent-ish TEDx talk from Mr. Landman. More soon, stay TUNED (omg).